Hard cover and Kindle available on Amazon! When was the last time you read a trading book written by a real hedge fund manager? Did that book give you any details on actual trading methods? Think back to the last few trading books you read. Were they written by professional authors, bloggers and lecturers? If they were, they were likely better written than mine. They were probably more entertaining and offered easier solutions and quicker gains. I don’t deal in wishful thinking. I don’t sell trading systems. I manage institutional money. I trade for a living. My point of view will probably be very different from the other trading books you might have read. Following the Trend is a book for professionals or those determined to become professionals. I will take you on a ride through my world. The world of large scale systematic, trend following futures trading. Some of this world is excellent. Some is a complete nightmare. My book will show all of this without bias. You will get all trading rules. Yes, no additional rules will be for sale on this website. I’ll give you a robust set of rules strong enough to be used as they are. Then I’ll point you in the right direction for how to develop this further on your own. Trend following is all about finding the right indicators. You need to carefully experiment with variations of oscillators and moving average lines. Finding the right settings are key. The best thing is to invent your own indicators and settings. Trend following trading systems are extremely complex. You should have a Ph.D. in physics of mathematics. If you don’t have this, you are better off buying a system from an author or blogger. A few thousand bucks should do it. The entry and exit rules are critical. Spend all your time developing the exact entry and exit criteria. Use the optimizer in your back testing software for this. Or pay a blogger to help you. You can do professional trend following on just a few instruments. All you need is to trade the Nasdaq or the S&P. They are big and liquid, so you don’t need anything else. Trend following on individual stocks works great in up and down markets. As long as you have the right indicators. Once you have a great trading system, everything is really easy. Just follow the signals. Take the trade once per day and hang out on the beach the rest of the time. The money will be rolling in. Everything in this section is complete nonsense. Except this paragraph. Buy and sell rules are almost irrelevant. There are not a whole lot of different ways that trend following can be done. The exact method or indicator you use does not have a big impact. Constructing a robust trend following trading system is not terribly difficult. People who tell you that this is the hard part either didn’t understand or want to sell you their trading systems. The key part of professional trend following is diversification. Trade all asset classes and plenty of markets in each. Trade live stock. Trade lumber. Trade soybeans. Trade the Bund. Trade platinum. Trade natural gas. Trade everything. At the same time. The biggest single factor for your bottom line is your asset mix. How you chose your asset classes and markets is the key decision point. It’s very far from easy to trade trend following managed futures. You will lose on up to 70% of all trades. Often you will have big losses. The day to day volatility can be severe at times. Sometimes you get periods of a year or more when you just keep losing. If you don’t properly understand the nature of trend following you will not succeed. It doesn’t matter how good your trading system is. Unless you are fully prepared for how it behaves on a daily basis you don’t stand a chance. Learn to overcome these problems and you will have a big profit potential. Outperforming the equity indexes are easy. Outperforming mutual funds is even easier. What people fail to realize is that the reward to risk ratio on equity indexes is horrible. Beating them is no feat. We are shooting much higher. In the 22 years from 1990 to 2011 MSCI World Total Return gave an annualized return of 4.7%. The largest drawdown it saw was 54%. That means that at the worst point you had lost over 11 years of normal performance. But the equity market always goes up in the long run. Right? During the same period the core strategy presented in the book gained 17.9% annualized. It had a maximum loss of 20%. Learn proper trend following. The professional way. Your reward will be very high annual compound returns at very acceptable drawdowns. It will not be easy. It will not be quick. But it will be profitable. Are you impressed by the big CTA hedge funds? The ones managing hundreds of millions showing big positive returns during bull and bear markets? They are extremely secretive about what they do and how they trade. Can you keep a secret? I can tell you what they do. And I can prove it. I will show you how to reverse engineer these funds. They are trend followers and there are not many ways to do that. They all look different but they are in fact the same. Take one robust trend following trading strategy. Just one. Doesn’t matter which one as long as it is reasonably robust. Then vary asset mix, time frame or risk factor. Just these three variables. This is enough to replicate most large CTA funds with correlations of up to 0.85. Do you want to know how all this is done? I hope you won’t delete my post as I believe that you will accept not only positive reviews but also some critique. First of all. This is just another book about trading. The only difference is that the book represents some eloquent and sharp ideas and phrases in order to attract trader’s attention. Such phrases like “money management does not work”, “truth about trend trading in stocks”, “investing your own money is a bad idea” etc. These phrases attract people’s attention because they sound radical, agressive and unusual. Unusual things always attract attention. Isn’t it? Even though you say about other authors that they never write truth, you yourself wrote a book being the same author with the same ideas. It’s a good marketing ploy. But not all the people are stupid not to understand it. Second of all. Would you tell me, please. Why some so called traders, investors or fund managers become book writers? What changes in their mind and brain that they turn from investors to writers? Do you really think Mark Zuckerberg or Sergey Brin will ever write a book something like “How to build a billion dollar company” or “Secrets of the biggest companies in the world” or something like that? Do you really think that Lloyd Blankfein will ever write a book called “How we make billions in Goldman Sacks”? I very much doubt. Even if they write some kind of books, they are mostly their biographies and memoirs with slight recommendations about the market and/or their business. It doesn’t make people rich but gives them a right direction to the right way. They will never give you a complete business plan of their business. But this is what most “traders”-book-writers do. They yell “Read my book, because everything you knew before doesn’t work. In my book you will find what really works”. Isn’t it weird? If not stupid. Your book is selling for about $50. Let’s say Amazon takes its interest from the price. So you will get lets say $40 per book. I suppose you have at least 1000 copies published. $40 * 1000 copies = $40 000 dollars of profit. Else you have a monthly subscription (hmm, even more oddly). You have about 900 twitter followers. Let’s say you have not less than 100 permanent subscribers. 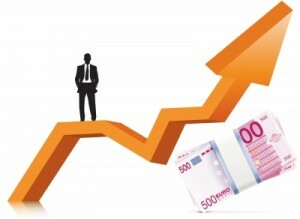 $150 * 100 = $15 000 monthly income only from your subscribers !!! Bottom line. I personally think that you make money from your book, subscribers, paid tips, paid recommendations and from the premium services… rather than from the market. I never follow traders or investors who sells something !!! Because it destroys the concept of a “successful investor” who doesn’t need money because he makes money from the market… but instead, for some reasons, sells a lot of stuff and ideas. Serious traders and investors sit quietly and make their money in silence. And never scream that “trend trading in stocks doesn’t work” or “investing your own money is a bad idea”. As soon as Warren Buffet and George Soros represent their “complete investing systems” (LOL) then I promise, I will apologize and take my words back and will change my mind. But so far… I’m with my current thought that I have just described. Good luck in your writing and paid coaching career !! You’re absolutely right to be suspicious. Most trading book authors lack any sort of real background in the business and they make money on other things. That’s why you need to do a bit of due diligence. Why write a book? While there are several reasons, such as fun, ego, etc, direct revenue isn’t really one of them. Your numbers are very off, it doesn’t really matter. I personally make around $5 per book, but I’ve also sold quite a bit more books. In the end, I made somewhere around $40k in three years. Frankly, that’s so little that it wouldn’t be worth bothering with. However, the attention around the book has helped me market my firms investment products. Now that’s where the money happens. My firm has a fair nine figure amount of assets under management. The revenue from a single $5M client, which isn’t even a big client in the institutional world, is significantly higher than my little hobby projects like books, websites and research. You seem to have misunderstood my book a little though. I never tried to reveal any ‘super system’. I wrote a book about a standard trend model that everyone already knows about. I used this to explain the past success of the trend following business. This is a demo trading model that works well to explain the business as a whole. The book has been an excellent marketing tool for our investment products. My idea with the book was to write an honest story about the mechanics of trend following to use for marketing. Yes, it’s about making money in the end. I like writing books and articles and I’ve come into contact with many interesting people. But of course, we’re in the business of making money. Bottom line, Sergey, is that you’re right to be skeptic. Many authors and almost all ‘coaches’ and system sellers are frauds. I can tell you this… The combined money I’m making on the book and the online subscriber report in a year is less than I make in a single week as a partner of a medium sized asset management firm. I don’t say that to be arrogant. It’s just the way things work in this business. I wish you the best of luck in your trading, Sergey. Stay skeptic! Honestly I was sure that you will delete my sceptic post. Or at least you won’t answer. But you replied… and even more… you explained everything pretty honestly. And for this I respect you !! Seriously. I wanted to see your reaction on my post, and to my surprise you behaved with great dignity. I do respect you for that. You know, these days there are tones of so called “professionals” that print books all the time and sell lots of stuff etc. Many of them don’t make money from the market, but they make money from their coaching business. I bet you understand what I am talking about. Therefore I decided that I should write everything what is in my mind. I’m really tired of all sorts of “professionals” (read “scammers”) and I simply couldn’t stay quiet. I thank you for your understanding and I thank you for your honest reply !! I really appreciate it. I may be disagree with the ideas in your book or your paid subscriptions. But it doesn’t matter. It’s your business. What I do respect is your personality and the way you answered my post. Thank you. And we DO must stay sceptic, because of all the dishonest people which keep surfing internet in search of silly easy bait to take its money in exchange for useless stuff. As being a Russian, I do know much about scammers. We got lots of them here. Thank you, Andreas. And good luck !! First of all, English is not my first language, so, I apologize for any eventual mistakes. When I read this message from Sergei, I thought he was a little impolite or even aggressive. Nobody is obligated to read a book or subscribe to any service of any kind. If you don’t believe someone or something, you just don’t read it. And I also believe that being skeptical doesn’t necessarily mean to be rude, there are other ways to approach the subject. But after a second reading, I started to have the impression that this message could be fake, challenging on purpose, just to give the author the opportunity to give a good response, so people would read and think, ok fair enough, he makes millions with his company and writing is just a hobby. Well, it really doesn’t matter the real story here. Every person has total right to be successful on something and write a book about it. Otherwise, we would never read a plastic surgery book written by a successful plastic surgeon, because he makes more mony on surgery, or a good law book written by a successful criminal lawyer, or a Nobel Prize economist, etc. Writing is not always about making money, it is also about enjoying your profession, being recognized for your work or your ideas, improving your career, and even the pleasure and pride to do it. But of course, if you have studied a subject and spent your time and effort to write something that eventually could help others, why not profit from it ? Why give it for free ? I think trend following is a fascinating subject and have studied for the last 4 years and still want to learn more, develop a robust system for my operations and 50 bucks is not cheap, but also not expensive to have access to a new material that could help me with that. I don’t expect one book will cause me to win one million dollars in the market, because if it was possible I would pay even more than 100 k for that. I don’t even expect it to be the best trading book in the universe. But I like reading and I do know that it is the only way to find out if the material can help me. My point is, if you are interested on the subject, buy the book, read it, like it or not, there might be something usefull. And of course you might get surprised after all. I am sure I am not going to get poorer because I paid 50 dollars to read a book. Sometimes we pay that much to have lunch, and the food is not that good. Mr. Clenow, congratulations for your work. I have just met your website and I will read your book and publish my honest opinion on it. Thanks, Henrique ! I’m looking forward to reading your views on the book. Hi Andreas, as promissed, I am back wit my impressions on your first book. It took me a long time to get it because I had to wait until it arrives in Brazil. An I also read it slowly, taking my time, since I’ve paid so much for it, rs. Absolutely sensational book. I was initially suspicious about it specially because of the price, higher than the average books on the same subject. I still consider it a bit expensive but I have to confess that I loved it. Cleanow is an excellent writer and gave us a fantastic manual on trend following for real life. For me, as I am not American, it was the best class about futures contracts specs in US, how they work, and how we can trade them that I ever had. The trading system itself is not the best subject in the book. Not because it is not good, but as he said, there’s not a hole lot of ways we can trade with trend following and it allows us to adapt our own trading system to the most important concepts spread throughout the book.The year by year chapter is very interesting. I’ve read it with patience and paying attention to every detail. It gives us a realistic impression of how hard and extremely difficult it would have been to trade the system over the years. This kind of information I’ve never found anywhere else. Comparing this book with Michael Covel’s Trend Following would be the same as comparing the little brochure about safety procedures we find on the back of the front seat in airplanes with a complete technical guide on how to pilot the air craft. Covel’s books became child annotations after I saw this new approach. Totally recommend it to everyone who really wants to know what trading futures with a systematic method actually is. I appreciate your comments, Henrique and I’m very glad that you liked the book! I agree that the list price for Following the Trend was far too high. I wanted a premium price tag on it, above the usual me-too books, for marketing purposes. It’s simply about perception. You can give away the most valuable information in the world for free, and no one would take it seriously. Put a high price tag on it, and suddenly it appears valuable. For Stocks on the Move, my latest book, I can set the price to anything I want since I’m self publishing it. I still want to have a premium price tag on it, but I settled on a more reasonable $38. Interestingly, me and Meb Faber are taking opposing views on this point. Meb is a very smart guy. He’s an industry professional who knows what he’s talking about. We agree on most things, but on book pricing we’re on two sides of the scale. He aims for maximum distribution with a price of about $1 for his book, while I aim for the premium perception pricing. Frankly, there’s not much money in books, but they’re great as business cards. He aims to give his business card to a maximum amount of people, while I aim for a more selective approach. Just two different approaches, and none us of are right or wrong here. I hope you’ll like the new book, Henrique! Please check back and tell me what you though of it! I am not getting reasonable values with the formula provided for the annualized results formula for the excel spreadsheet on page 81 of the book “Stocks on the move”. Can you provide your excel spreadsheet. , so that I can code this amibroker? So, far I love your book. It is an interesting read. Hello Andreas. I am a tertiary student from Hong Kong. I have bought the translated version few days ago and I have been addicting to it. I spent around four days to go through around 1/2 of the content and it was absolutely amazing to me because of the scientific confirmation of the investment method, which nearly all of the invesntment books selling in China and Hong Kong cant do that. But I have a question. You mentioned that we have to invest into 5 areas and in each area, there will be 10 different subjects (I am not sure if I make the correct wording as I read it in Chinese), then is it still possible for one to own only HKD $100000 to operate the method you mentioned in the book? Or can I invest only one subject in each of the five areas, rather than the old method, 50 subjects? It is really hard to compete in Hong Kong nowadays, and I do hope to learn more and surpass the others. Thank you Andreas. In the English version, used the terms five different asset classes and ten markets in each. These exact number of markets here are a bit arbitrary, and I wanted to have an equal amount in each sector for educational purposes. To make it easier to compare. In reality, you would want at least 30-35 markets, to be able to get some diversification effects. If you only trade very similar markets or too few markets, you will have a much higher degree of luck involved. With enough markets, the results will get more steady. 100k HDK (around 13k USD) is in my view far too low to trade futures. In the book, I recommend a base capital of around 1 million USD, which would be around 8 million HKD for efficient diversified futures trading. If you have a lower amount, you could look at using CFD markets as a substitute for futures. They require lower capital, but have higher fees. Also, the stock markets are much more friendly to smaller portfolios than the futures markets. I wrote a book last year about systematic futures models, and we’re in negotiations with Chinese publishers at the moment. Hopefully that should be out in both Simplified and Traditional Chinese in a year or so. Thank you Andreas! I asked many book shops and most of them told me that the book has been sold out, and by the way, the design and translation perfectly suits the Chinese too ha! And it is very appreciating that you told me the truth about futures trading. I discovered that I have very intense interest in financial market, especially for futures trading after I got to university. I think I am going to learn some program writing first as mentioned in the second chapter of your book, and stick pieces to pieces to form a prototype for my present amateur level of index futures (Hang Seng Index) trading in this recent period. Although I cannot make full use of the trading model right now, it still makes me learn a lot such as those knowledge about risk factor, ATR, importance of adjusted and non adjusted data and the key to winning, back testing. I will transplant these elements into the prototype if available. Cant wait to see your new book coming!! I have read your book and tried to replicate your results. And then you sum them all and get total return 30.4%. Do you divide the PNL by your total starting cash ? I feel this number is very high given you only risk only a small portion of your asset for each trade. Is it possible that you can share with us all the trades (price and size) in your simulation, at least for a year ? Is it possible to trade your Tf system with Etf’s (only the long ones and not the inverse etf’s or leveraged ones). How many non correlated etf’s would you recommend as a minimum to start with ? Ps I have not bought your book yet but will do if your tf system can also be traded with etf’s. There are many good ETF strategies (and I might even write a book about that if I find the time), but I wouldn’t apply a regular trend model on ETFs without some modifications. ETFs lack leverage, so you’re limited to cash utilization. That means that it’s very hard to trade markets with too low vola, such as treasuries. They just take up space in the portfolio. Also, most ETFs (ETNs, whatever) on commodities tend to be pretty bad in the way that they’re structured. So you can’t simply replace corn with a corn ETF. No problem with systematic trading models on ETFs, even trend following in style. But don’t use the exact same model. I’ll try to write some more about this and what can be done in some article soon. There is a decent book on ETFs trading: Anthony Garner – A practical Guide to ETF Trading Systems. It presents two trading systems for ETF universe. It may seem not as exciting and deep as FTT and Stocks On the Move, however, the author did extensive test runs and there are insights to be gained from it. Try the book Systematic Trading by Rob Carver. It’s the best book I’ve seen on the subject of quant model development. I have read both of your books, and enjoyed them both immensely. At this point I would like to attempt to recreate your strategies and was hoping to ask a couple of questions before I get started. Firstly, if I implement the equity momentum strategy then does it make sense to remove the equities section of the investment universe for the trend following strategy? Have you considered how you would combine the two? Would you simply trade each strategy with fixed allocations to each or is there a better way to incorporate the equity strategy into the trend following strategy? With respect to the RightEdge platform you recommend, will that handle all my Portfolio management and tracking requirements or will I need to export data to Excel and build spreadsheets for further analysis? For example, is it straightforward to build a correlation in matrix in RightEdge or is that easier to do in Excel? Combining strategies is a very important, and quite complex subject. Counter-intuitive perhaps, but if you’re a professional you probably don’t want to combine it, for the reason that it’s much harder to sell. A CIO at a pension fund usually wants building blocks, not combined strategies. Making a portfolio is his job, not yours. If you’re trading your own money, or targeting retail/HNWI, it could very well make sense to combine strategies though. How you do it depends very much on what you want to achieve. But I see nothing wrong with keeping the equity indexes on the futures leg. Trends are there for the taking. 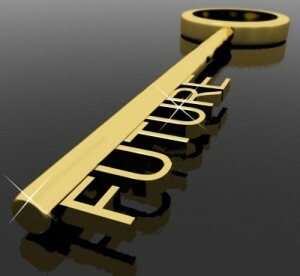 Keep in mind that the futures model in the book was meant as a basic model to explain the trend following industry. You can do much better than that model. It’s a good learning tool, but I never meant for people to trade that exact model. I’d suggest to use Excel, or even Google Sheets if you only deal with stocks. Google Sheets has some great real time tools if you don’t have a market data platform. You can use RightEdge for a lot though, as long as you’re willing to build a bit. I use RE as a reporting engine for instance, with a plugin that pushes data into a database for analysis. thanks for getting back to me, your insights are appreciated. I’m curious about your point suggesting that the trend following model in your book is not meant to be traded. I accept that this model can be improved on, but based on the evidence presented in your book, this model captures a significant portion of the returns available to trend following models, the returns themselves are quite impressive, and they are not that far off from models that you actually trade. So why wouldn’t the model in your book be appropriate to trade? With respect to the actual book itself I would like to ask a couple of questions. Firstly, would building a correlation matrix to ensure oversized bets are not made on highly correlated trends work to reduce the initial capital requirements of a trend following strategy? Secondly, you suggest the higher interest rates available in the 80’s and 90’s significantly contribute to the returns of the strategy, however in real terms the interest rate spreads between today and the 80’s and 90’s is much smaller, so presumably this is less of an issue when considering real rates of returns, is that correct? Lastly, I wonder if you think the end of the commodity supercycle, the possibility of an era of rising interest rates and the difficulty of making money on the short side of the trend following strategy are serious threats to the future profitability of the strategy? What I mean is that the model presented was designed as a demo model, not The Clenow Super Trading System. It’s not that it’s a horrible model. A bit simplistic perhaps. But I made that model as a teaching tool, to teach a principle and let people build around it. All too many readers mistook the model for a super secret trading model that everyone should trade. The parameters are more or less chosen at random and meant as a middle-of-the-road trend model. Everyone should do their own research, come to their own conclusions and pick a trading approach for their own reasons. Never trade any model you find in any book without doing your own research. Correlation matrix: See the reply below to David. It’s a tricky subject. You can lower risk, but you’ll also take a big cut off the right side tail as well. It’s not an easy solution and up to everyone to figure out what fits them the best. Real returns: Frankly, it’s mostly irrelevant. Unless you’re an economist, why would you care about real returns? You could adjust everything by inflation, but what would be the use of that. Divide everything by the same factor, and you’ll end up with the same conclusions about everything. Possible rising interest rates is an interesting issue of course. That could potentially be a completely new type of scenario and it will be very interesting to see how models will deal with that, if it materializes. I have a hard time imagining that there will be no trends to trade. But perhaps the models need to be adapted. Who knows until we get there. Models are and should always be improved and adapted. That’s the whole point of research after all. The idea of making a model once, never changing anything and trading it for twenty years is just legends in retail oriented trading books. I sincerely appreciate your responses. Hi Andreas, loved the book (FTT). In the book and your comments here, you say we don’t know what markets will exhibit the next trend(s), therefore we must trade all of them at all times. What are your thoughts on market selection. In my backtests and my own trading I experienced its sometimes great to be massively exposed to one set of markets (e.g. when global bonds of all durations increase in price in lockstep over many months). Except when it’s not (counter-trend snapback moves when correlations come back haunting you). I understand the book had to be kept as simple as possible. However, in your own research and trading, do you find value in selectively only taking on a trade if the market/direction adds a diversification benefit? And selectively NOT adding the trade if we’re already exposed to highly correlated assets in the same trade direction? You’re beating the drum of keeping it simple. Am I over-complicating matters? This is a huge dilemma of course. The problem is clear, but not the solution. Yes, highly correlated bets in the portfolio on massive leverage will get very painful when everything turns. But at the same time, much of the returns from trend following comes from this very type of bets. Remember the great returns we all had back in 2008? Those were a direct result of taking on very correlated positions. Sure, you could try to reduce these corner risks (and many funds do) but you’ll have to give up those great returns. So what to the big guys do? Well, they don’t even agree among themselves. I’ve discussed this topic with several fund managers with over a billion each under management and great results for decades. Some say that it’s essential to put strict risk limits in place based on correlations and sectors. Others say that their whole strategy is based on taking massive corner risk in such situations, and that limiting it would kill profitability. Fist, this is a x-post from another section of this site. I’m trying to learn more about the ins and outs of futures term structure and thought you might be able to suggest some relevant resources. I’ve read your “Term Structure – The forgotten piece of the puzzle” article and the other public publications on your site but still feel like I’ve just scratched the surface regarding the relationships between contract months, basis, etc that are right in front of me. I feel like these relationships tell a story though I’m not sure how to correctly interpret what I see. Are there any books and/or papers that you like in this area and that you’d recommend? Also, does your Following The Trend book cover this? I try to reply to all comments on the site, but at times there’s just too many and I miss some. The book doesn’t cover this, as it’s a bit beyond the scope. The book tries to teach what trend following really is and how it’s done in practice. It uses a trend following model, where all rules are explained in detail, to show how most trend following strategies are more or less the same. I go over detailed trading over many years to show how such a model really performed, good and bad. I also reverse engineer some major futures hedge funds to prove that their methods are not materially different from what I present. I’m not aware of any book that covers term structures in a practical manner. I do try to cover this in the subscriber part of this site, both in research documents and in the weekly markets report. Term structure is a major part of futures trading. Whenever I see some analyst showing a long term chart of cash gold, oil or other, and then drawing conclusions about how to trade the futures, I just want to shake my head in disbelief. Sadly, all too many don’t realize the fundamental differences between futures and cash and how the cost of carry often has an overbearing impact. Most likely, many analysts ignore it because it’s too complex for them and since they don’t actually trade anyhow, they can get away with it. In the premium futures report (did I really just plug that again?) I show term structure charts for 70 markets with weekly updated comments, and there are some research docs in there too that covers things like analyzing implied yield in term structures. suggests that doing so significantly lowers the profitability of momentum strategies when applied to the currency markets. I use realistic modelling based on my own background and experience in the field, but I didn’t take any particular academic classroom model into account. Sorry for dismissing it, it’s just that these kind of academic papers come out all the time, almost always written by people with zero experience outside of a class room, almost always spending 50-100 pages saying something that could be summarized in couple of sentences and almost never come up with anything applicable to the real world. Reading academic papers on trading strategies, I usually have this feeling of reading some random blog post, except that they try their hardest to use as complex sentences as possible to cover the lack of actual content. I agree academic papers are unnecessarily pedantic. Just to be clear then, the results presented in the book account for bid/ask spreads, and so are realistic from that perspective? Is that correct? “I am very sceptical about trading books and it takes a lot of time to find something worth of your money. For this reason I read trading books quite rarely. You will find hundreds of books describing trends, oscillators, lines, fibos and etc. Although this info could be easily found on the internet for free. The first thought in my head when I took this book was “ahh.. another book about moving averages”. But my thoughts were far away from the reality. Honestly I enjoyed reading from the 1st till the last page. 21st century traders are “the lazy generation traders”. There is so much scam for example in Forex business and it is so simple to download and install trading platform, draw some lines and trade, trade, trade…Frankly Andreas Clenow’s futures trading book gave me insight that I wasted 3,5 years just playing with charts. When I review my 3,5 years experience in Forex, I understand that I don’t know nothing about trading and markets. I’m just able to draw some lines on support/resistance levels, put some indicators and that’s all. That is everything what I “learned” in 3,5 years. It is quite disappointing. 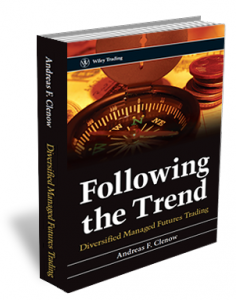 On the other hand “Following the Trend: Diversified Managed Futures Trading” gives insight how hedge funds really work and how you can devlope your own strategy that competes with those funds. Don’t misunderstand me, this is not the book that offers such as “become rich in 3 months” strategy. Andreas describes the core of the trend followng strategy and where to focus if you want to develop your own strategy. And the reality is that without math or some programming knowledge you are almost not competative in this business. And it was quite mind-blowing that all these years I focused on things that almost don’t matter. I love trading. And this book opened my eyes. I need to do a short break and then consider my trading future. As I read your book in a quick way in the first time, I got that you give two examples to introduce the trend following ideas, and you mention too much on the breakout strategy compares to MA. On the contrary, My personal experience is to use the MA to get combined stable profit curve in the market, but I can’t get too much in your book. Is there any weakness or big risk to adopt the MA strategy ? Is there any filter or else to patch up it ? you prefer to use breakout instead of MA? I look forward to get more from you about the MA, to strengthen my idea, thanks a lot. Sorry for the English because it is not my mother tongue. such a great book indeed! By chance, have you got the core strategy results updated as of December 2015? Did I? Hm.. not that I can remember. From an American terminology point of view, I have never been a CTA, nor do I know much about it. In the US, ‘CTA’ is a regulatory term defined by the NFA. A person can become a CTA by being regulated as such by the NFA. Outside of the US, the term CTA is used a little differently. In industry terminology, a CTA would be a futures hedge fund. If you would run a futures trend following fund out of Paris, people in the business would call your fund a CTA. Not you, but your fund. Obviously the term originally comes from the NFA regulatory term, but as you see the meaning has changed about overseas. Incidentally, I once had to explain that under oath in an American court. I was hired as an expert witness in a hedge fund civil suit some years back. Lucky for me, I was well prepped and prepared. One of many attempts to trick me, was just this very question. “So, Mr. Clenow. According to this document, you are a CTA. Would you care to elaborate?” Trying to get me to agree that I’m a CTA, so that they can later come back and claim that I lied about regulatory status… I gave them the same explanation as above, and they went on to next attempted curve ball. In Chapter 4 and Appendix C, his book describes portfolio optimization approaches to determining, among other things, instrument weights in a portfolio. I think the author works mainly in Python. Do you implement some version of that in your work on RightEdge? If so, can you recommend any C# math libraries that include markowitz and other optimization approaches? Many thanks for any leads. Just purchased the book — looking forward to it. I’ve never been much of a trend follower and I actually hesitate to believe I have the psychological strength to handle it! Nevertheless, I’m hoping to just pick up one or two new pieces of information from your work that I can incorporate into everything else I’ve learned over the years. I have always been more drawn to shorter duration, smaller profit trades, which usually are buying on some weakness and selling on some strength. I do see that this can never amount to a big winner, but I’ve managed to profit a bit over the years. I actually keep hoping that I can be convinced to at least attempt a trend following method for a few years, so maybe your book will help me along that path!